Google+ Reading Teen: The Reading Teen Team had such an AMAZING time @ALA10 !!! 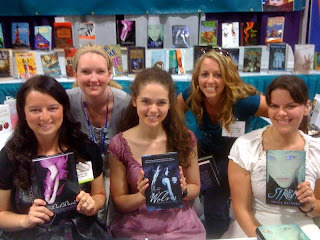 The Reading Teen Team had such an AMAZING time @ALA10 !!! So the Reading Teen team is absolutely exhausted. 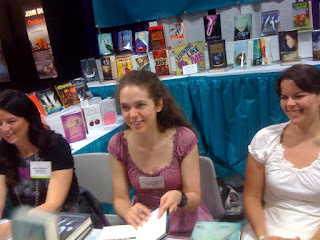 Running around getting Arc's and books signed all day long is so tiring. After you've had tons of weight on your shoulders - literally - due to stacks of books in your bags for four days... it's time for a bubble bath and a little R & R. So I will show you some pictures I took to tie you over 'till the exciting post on Wednesday. Andye and I with The Dark Divine by Bree Despain , Raised by Wolves by Jennifer Lynn Barnes and Siren by Tricia Rayburn getting our books signed. They were so cool and down to earth. 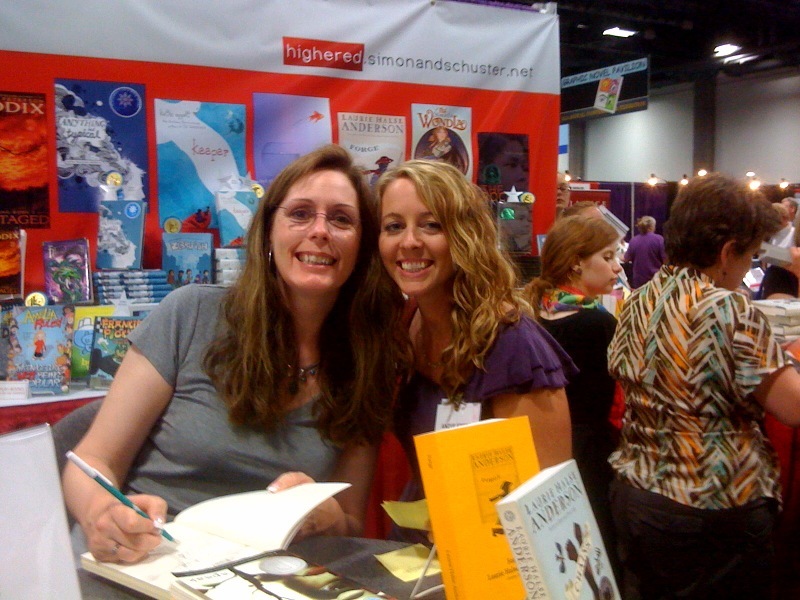 Andye with Laurie Halse Anderson , she is signing a book for Kit right now. 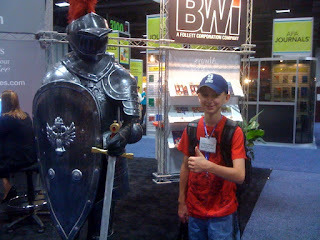 Austin having a good time with a knight who he says... This is not right, he has a single handed sword with a full length shield... whatever that means??? He's a dork! 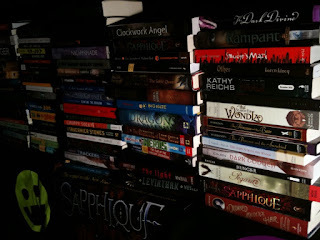 More and more books... what in the world am I gonna do with them all??? Did I mention that Bree, Jennifer and Tricia were very sweet and approachable? They totally were! 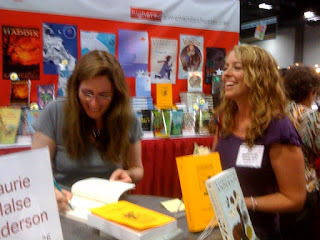 Andye having fun with Laurie Halse Anderson author of Speak . 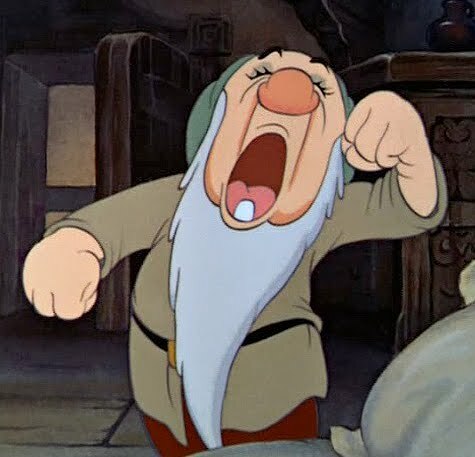 Well with a YAWN and deep sigh with eyes drooping... I will say Adieu' , I have a feeling I will be laying on the couch all day today in my sweats reading Beautiful Darkness by Kami Garcia and Margaret Stohl. 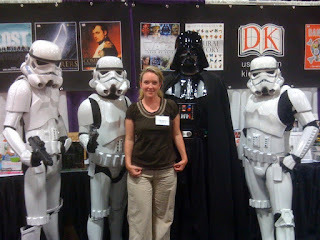 I'm gonna need a full day of rest to re-coop from the first and most awesome book convention I've ever been to. See Ya! Yaaaayyy! So glad you guys had fun :)! And Austin is SO CUTE :D! I hadn't seen him in pics before =P! I'm so jealous you got to meet Bree today!!!!! 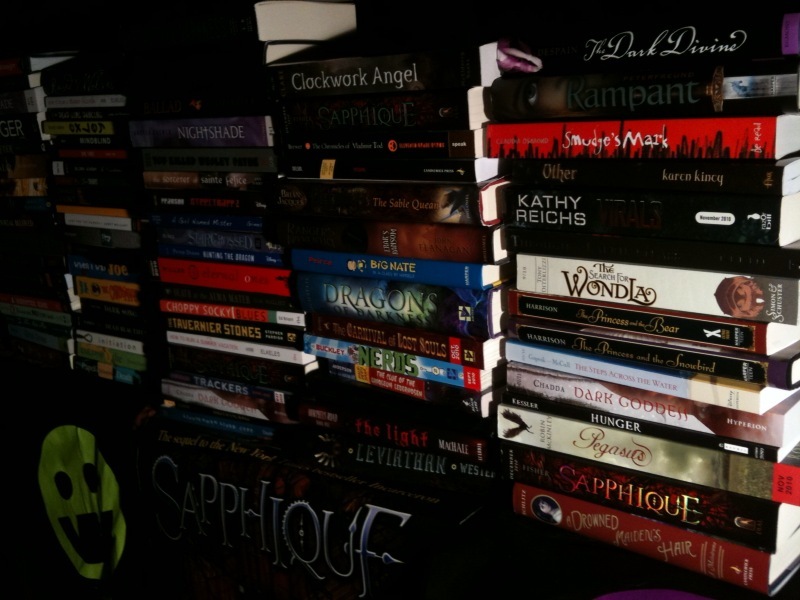 Also, my eyes can't take in all of the books at the same time. . . If you need any help reading some of those just shout *HAH! x)*! I am in AWE of the HAUL! WOW!! I am so jealous of you guys now!! 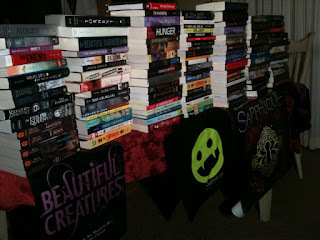 Meeting all those fabulous authors and receiving so many books! Happy reading! Oh, flakey flakey me ... this above is from me, Adele Griffin (The Julian Game) ... in case there are other Adeles in your blogging, reading, curricular, and extracurricular life, and I should never assume I am it. @Adele I personally did not get THE JULIAN GAME. So very sad :( Andye - lucky girl, got it. Very jealous. I, like you on my last day got a bunch for my kids ages 8 - 12, there are three of them. It was Christmas in June for my house today! So fun! You guys look like you had an amazing time. Super jealous. I wanna go to the next one!!!! 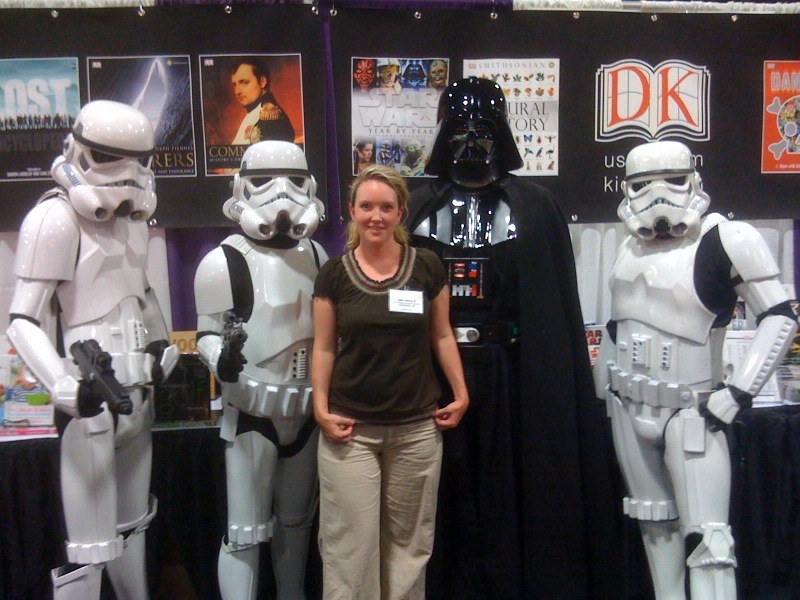 so incredibly awesome, If I ever go to a book convention like that I swear I'll pass out the minuthe I walk through the door. Your photos are freakin' awesome! But, anyway, I hope I'll go to ALA11. All the books look great, and I've read the synopsis for most of them, so I hope you'll enjoy 'em all ;). Ho-ly-crap! I've never seen such a pile of books before!! Thanks all!! We had such a great time!! @Karen all the books are Advanced Reading Copies, so they were all free! Yeah, we're cheap too!! Great site! My son is only (almost)4, so we don't need this quite yet...but it's nice to know there are other people concerned with what their kids are doing! What an incredible adventure. 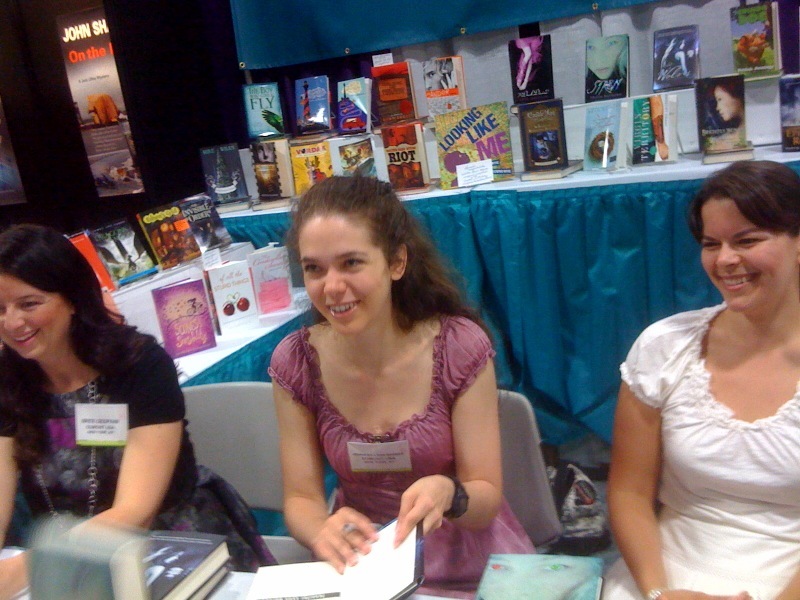 I can't believe how young all those authors are!